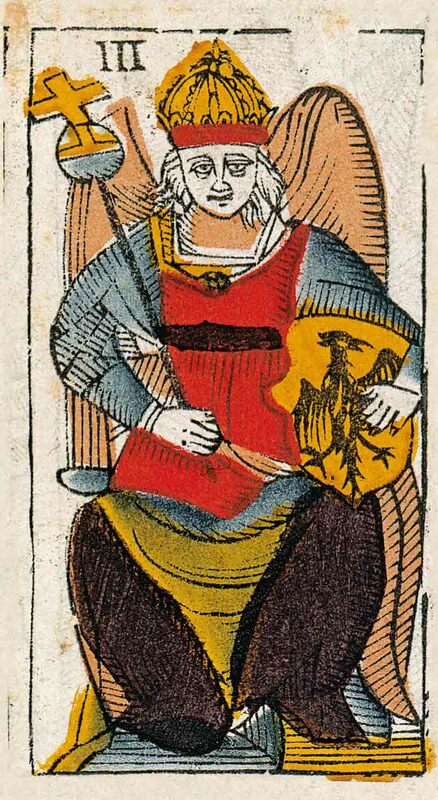 The re-edition of the Viéville Tarot is available. This new edition will be as close as possible to the original conserved in the Bibliothèque Nationale de France, (BNF). The dimensions of the cards are 69 x 126 millimetres and the proportions will be strictly respected. 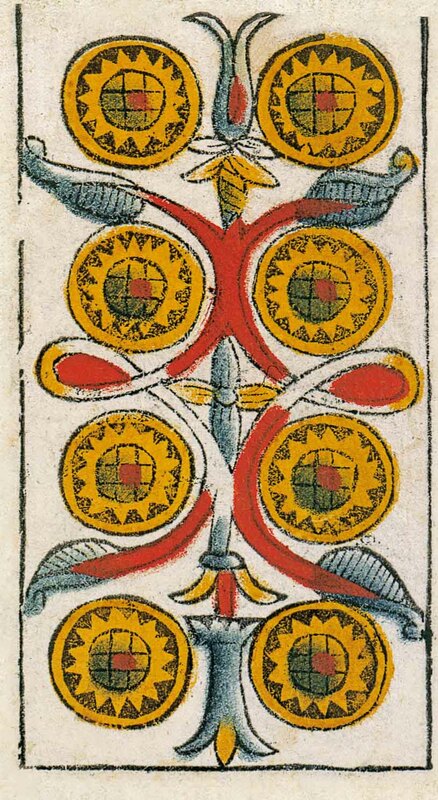 All the information are preserved, in particular concerning the borders of the cards which in some cases appear twice. This information is very significant. Thus on the Knight of the sword, we can see the marks of the border which connect this arcane to another one. We can also remark ghost-like traces of a watermark which appear on the white-ivory background of the card. These ghost-like traces connect each arcane with another arcane, and provide precious information. 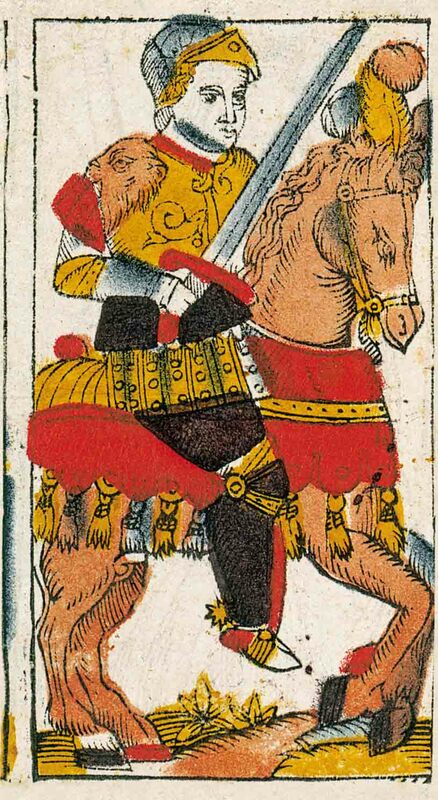 In the new edition, they will be visible as in the original tarot in the BNF. In addition, we have removed electronically the stamp of the BR (Bibliothèque Royale). This indelible stamp had been added by the Library to avoid theft, which justified its presence on the original. On the reproduction however, it can confuse the first impression of the top or bottom of the card, or worse in certain cases it is in the wrong position, and can lead to error. Suppressing it on the reproduction, in so far as it doesn’t alter any information on the card has only advantages. This new edition, which will come out in December 2012 will be very true to the original. 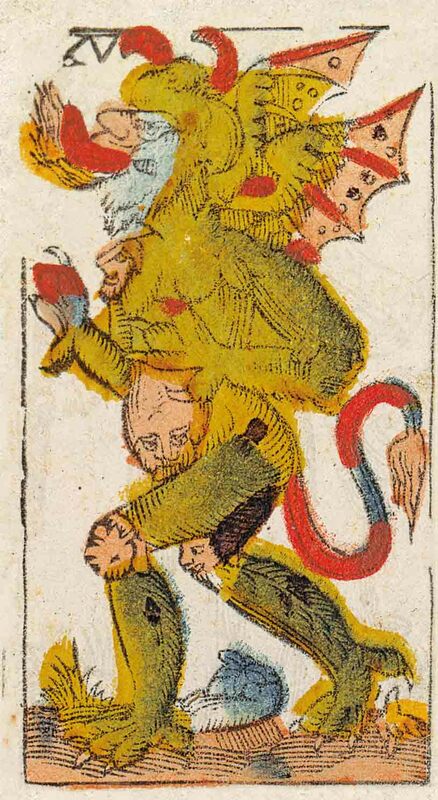 At the same time as the new edition, will appear the first part of the book “Les Mystères du tarot de Viéville” (The Mysteries of the tarot of Viéville) dedicated to the arcanes majors but not translated in englisf for the moment. The second part on the arcanes minors is finished and will appear in 2013.